Any home built before 1/1/1978 needs to be tested prior to any remodeling. If lead paint is found, it needs to be removed by a “Certified Renovator” by using lead safe practices. Dovetail Joint follows all of the Environmental Protection Agency law passed in April of 2010. We will test all areas to be remodeled for lead paint per the EPA’s guidelines to be sure if there is lead present or not. You will be provided a booklet with lead-safe educational materials. The team leader will also have a copy of documentation of certification and training with them on the job site. 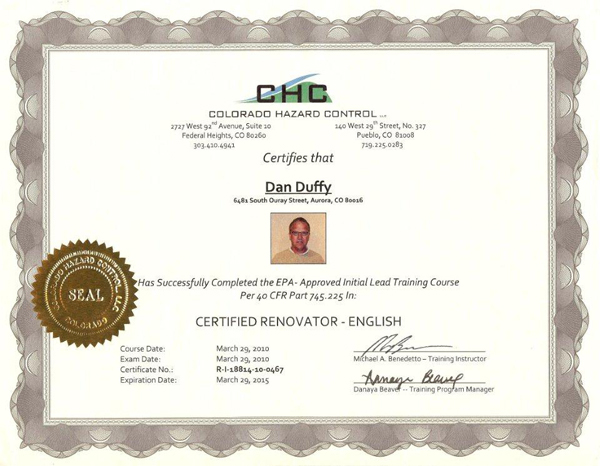 We seal all areas to be renovated inside or outside to contain any lead dust per EPA rules and regulations. Within each work area precautions are taken to ensure any dust is isolated to reduce lead contamination. Each contained area is cleaned up inside the enclosure and vacuumed with a Hepa Vac. The enclosure is then removed, vacuumed again and all surfaces wiped down. Finally the team leader does a white glove test to pass the clearance testing. All of your lead contaminated debris is disposed of properly according to the EPA rules and regulations.